I had an afternoon in the workshop yesterday and played around with the grinder and welder with mixed results. I must say that I´m impressed by the people that are panel beating and welding experts. They make it look so easy when they just cut out some old rusty metal and then on free hand cut out a bit of new metal, transform it to a spare part with exact fit that is then welded into place. After minimal work with the grinder you can hardly see that repair has been done. I´m not there, yet! One problem is to decide where to cut and how much to cut out of the rusty parts. I think its better to be sure that the rust is gone and therefor take some extra. And after yesterdays work I can add that its better to take bigger parts away to reach natural borders of the original structure. Making small patches sounds like a good idea but is very hard to do nice, at least with my limited skills. 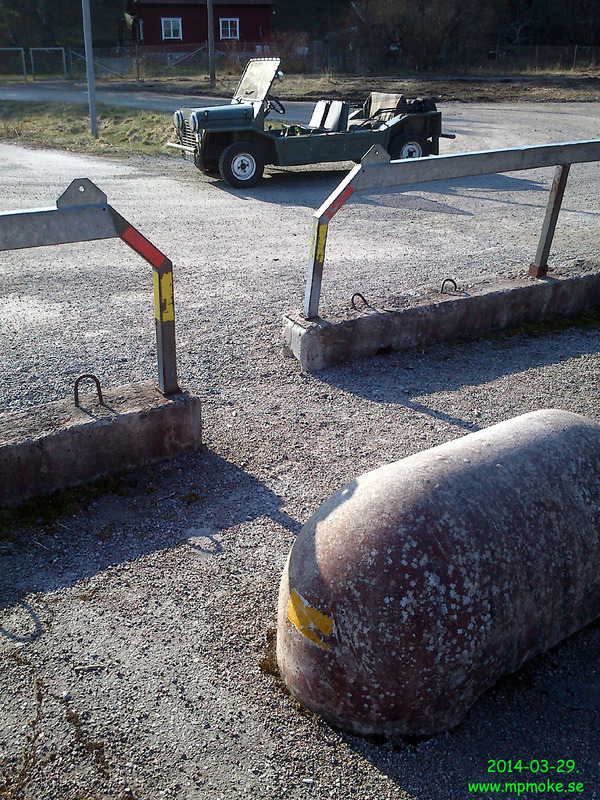 Well after some hours of work I had at least done some smaller patching, that I won´t show on picture here in the blog…, and also replaced two corners of the right hand side, rear mounting for the front subframe on the yellow Mini Moke. Then I ran out of ATAL gas for the MIG welder. I cleaned up in the mess, placed the tools on the bench, washed myself and had a cup of coffee while acting fire guard for a bit more than an hour before I left for home. Back on it later in the week! This entry was posted in body work, Technical and tagged grinder, metal, MIG welder on March 31, 2014 by admin. Yesterday, Saturday March 29, was a very sunny day in Uppsala. I had the intention to spend the day in the garage as I was free, but it felt better to take the chance and go for a drive in the sunny weather. 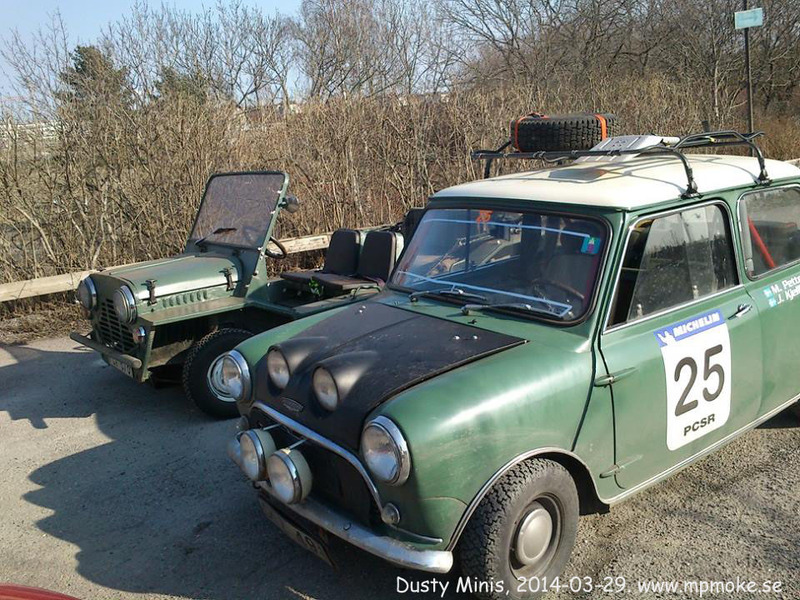 I had two Minis dirty from winter dust and take them for a drive would be great to blow the dust off. But which one to start with? I looked up to seek an answer and there it was, the sun! I climbed the Moke and off we went! I drove down to the southern parts of Uppsala, took only the small streets and roads and did stop once in a while for a photo, a break in the sun or to see something fun as the birds are coming back after winter. After a nice coffee break combined with a visit in the Mini workshop at Joel´s place (the Minilimo man) I headed home and arrived at the garage and had time to wash the Moke before it became dark. It was a good day out! 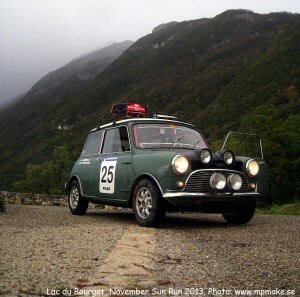 We´ll see if there is a chance to do the same with the Cooper today sunday. It is not as sunny as yesterday so it was a good decision to take the Moke yesterday. This entry was posted in Drives on March 30, 2014 by admin. 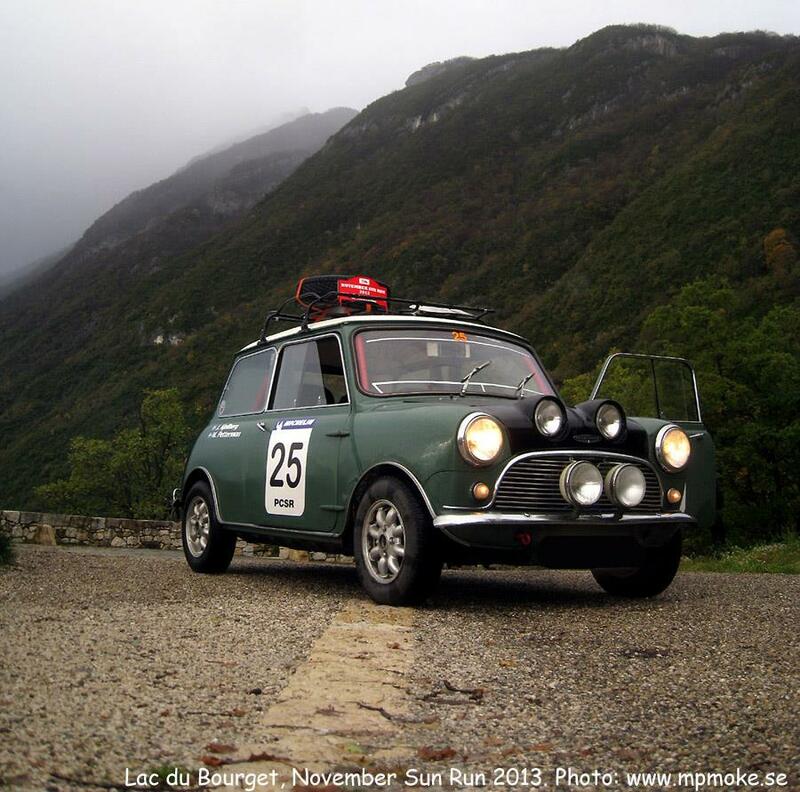 It is getting closer, the IMM2014- International Mini Meeting. 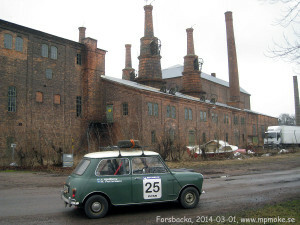 This year in England to celebrate the Mini 55 years and the Mini Moke 50 years. 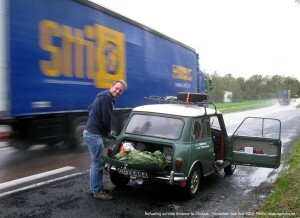 Last time we drove a Mini to Great Britain was in 2009 for the Mini 50 years jubilee. As we had an old Mini 1959 years model standing in a barn we pulled it out and scared it to life after 25 years off road. 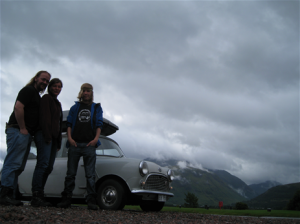 We succeeded to get it through the MOT and drove it to GB, first a trip up to Scotland, then down to England for the celebrations at the IMM2009 and then back home. Above you can see a picture of the Mini and the crew taken in front of Ben Nevis, a mountain that we also climbed to the summit. Stay tuned and news will follow on this blog! This entry was posted in Events, Quick update on March 26, 2014 by admin. Who could think that this little car could be thirsty? Oh, ye it is. 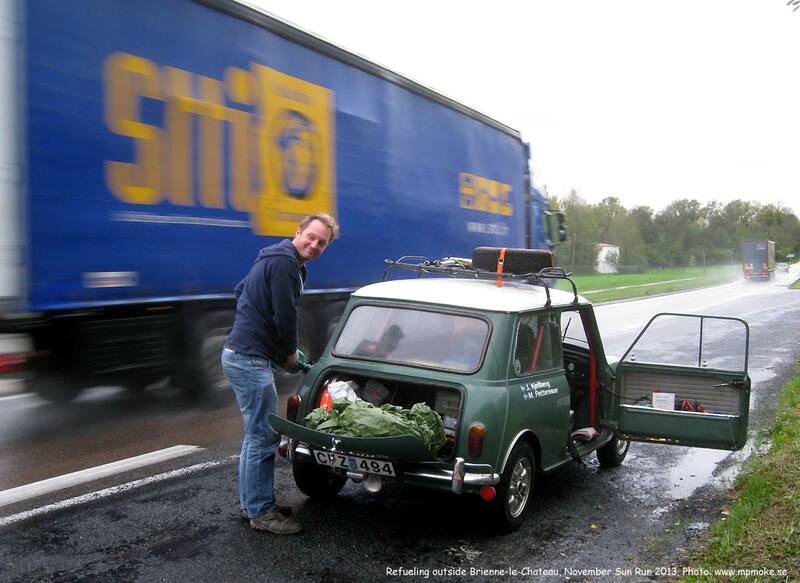 Here is one of many occasions when it drank to much and we had to stop and bring out the Jerry can! This actual picture was shot just some kilometers away from Brienne-la-Chateau, just close to Eclance, start point of November Sun Run rally. I was out with the Austin Mini Cooper -62 last weekend to take part of an ice racing event. The racing part of the event was cancelled as the ice was to bad. But a lot of nice vehicles were on site so still worth the 120 km drive, one way, and to pay entrance of 100 SEK. I have pictures from the event on the hard drive and will sort out some of them and publish, when time admits. 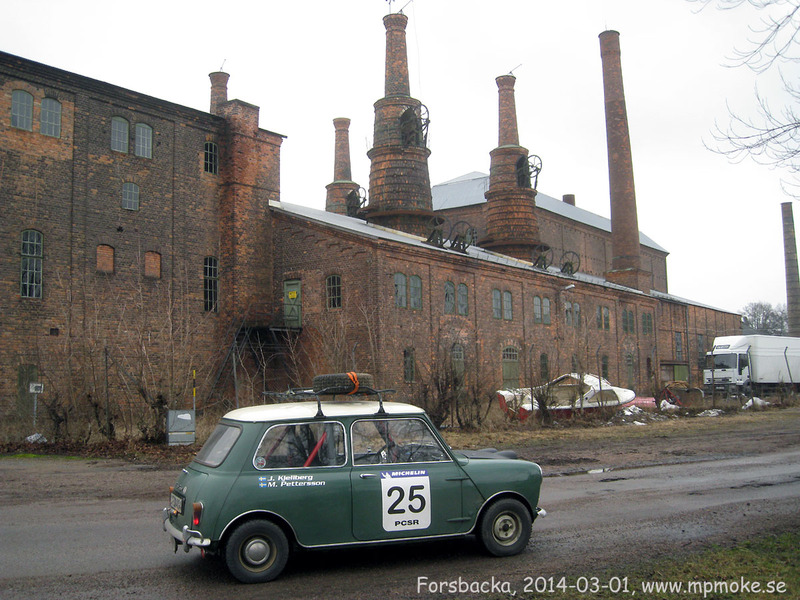 Meanwhile you can watch the picture above of the Cooper in front of the old steel works in Forsbacka, just west of Gävle, about 120 km north of Uppsala. I passed it on the way home from the ice racing event. I had to stop and make a picture. A Cooper in front of steel works, that must be a Works Cooper, or? Just imagine what a Mini workshop this place could be if money and time was unlimited! The subject of this blog update was “Works Cooper on ice”. If you just combine the two parts in the text above, then the subject is covering it all! This entry was posted in Events, Quick update on March 9, 2014 by admin. 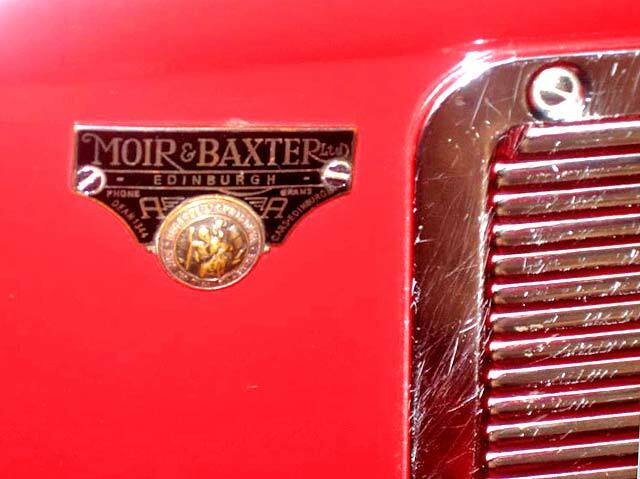 Found a small (50mm long and 35mm high) badge on passengers (left) side in the yellow Moke. 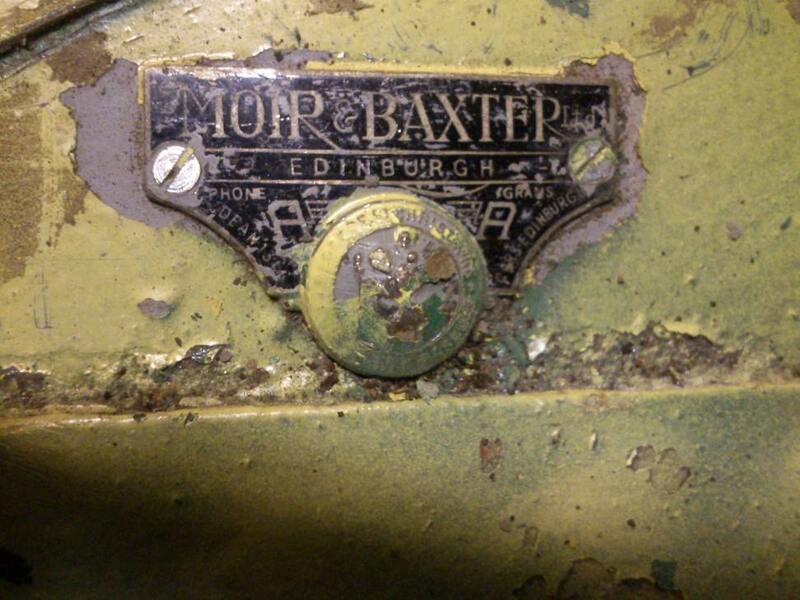 Moir & Baxter ltd, Edinburgh. First dealer or car converter or what? I called for ideas, clues or answers on FB and relatively quick I got an answer. They were a dealer in Edinburg. I got a link (http://www.edinphoto.org.uk/1_edin/1_edinburgh_history_-_recollections_moir_and_baxters_garage.htm) to a history page about them and their employees and there I could find a better pics of a similar badge, mounted on a 1966 Austin Mini Cooper. I will do some more research and report if I find something. This entry was posted in Quick update, Technical on March 6, 2014 by admin.